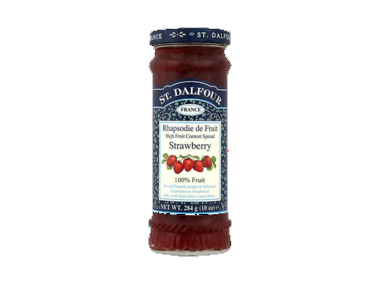 Order St. Dalfour Strawberry Spread from the Online Health Food Store UK. Buy St. Dalfour Strawberry Spread (no added sugar) - 284g and other quality Jams & Fruit Spreads safely online in the UK. St. Dalfour fruit spread have a high content of fruit. It's sweetened with unsweetened apple juice and does not contain added refined sugar. Our UK Health Shop sells real St. Dalfour and other Jams & Fruit Spreads from top-quality brands safely online to customers throughout the United Kingdom in England, Wales, Scotland and Northern-Ireland. View more products on the Online Health Food Store from St. Dalfour. Where to buy St. Dalfour Strawberry Spread safely online? Shop at the Online Health Food Store if you are wondering where you can buy St. Dalfour Strawberry Spread (no added sugar) - 284g safely online in the United Kingdom. Strawberry Spread - St. Dalfour Strawberry Spread (no added sugar) - 284g in Jams & Fruit Spreads and Honeys, Jams & Spreads.